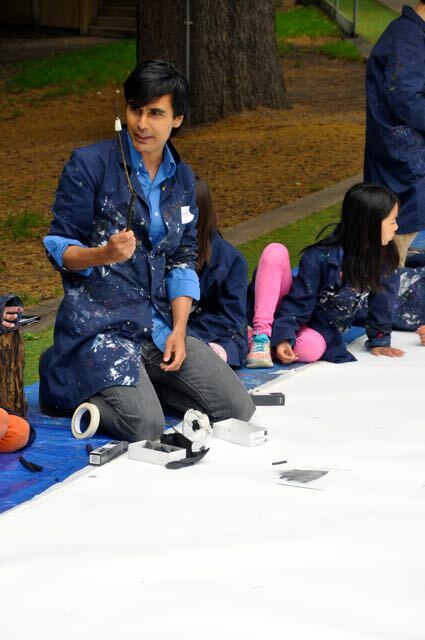 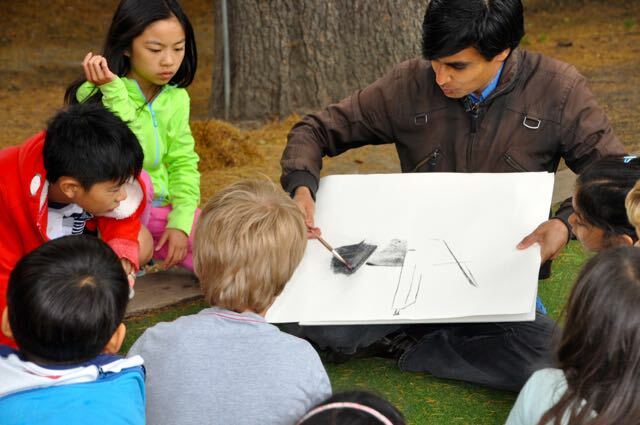 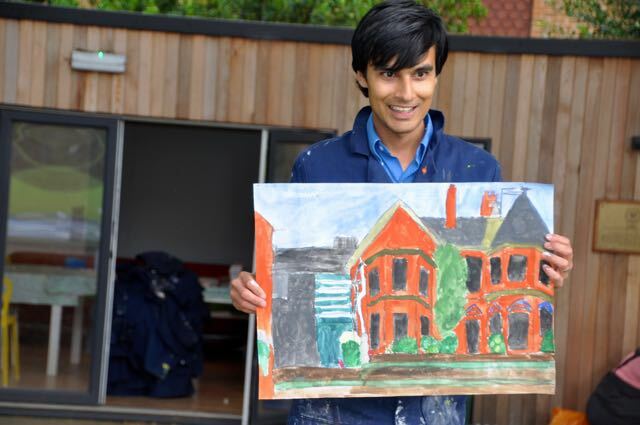 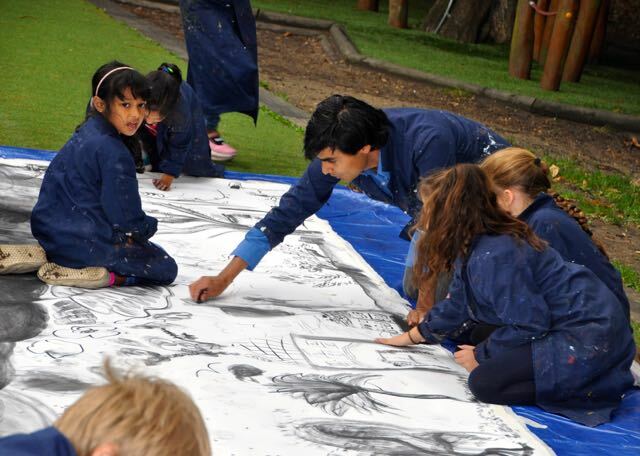 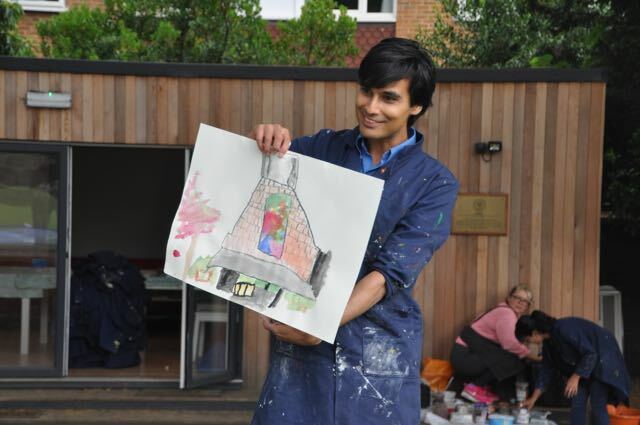 This summer Painter Matthew Krishanu returned to Children’s Art School to lead another 2 days of Paint the Great Outdoors. 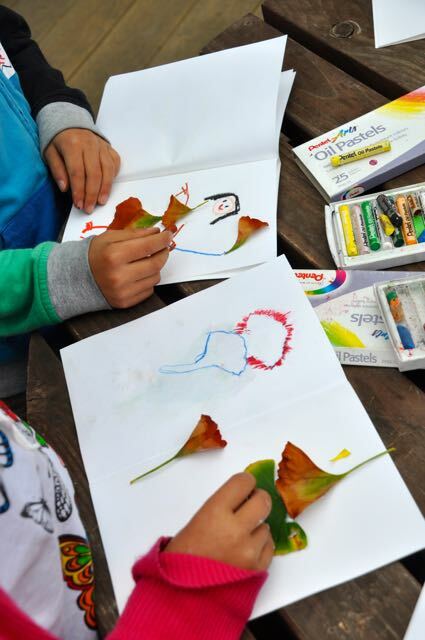 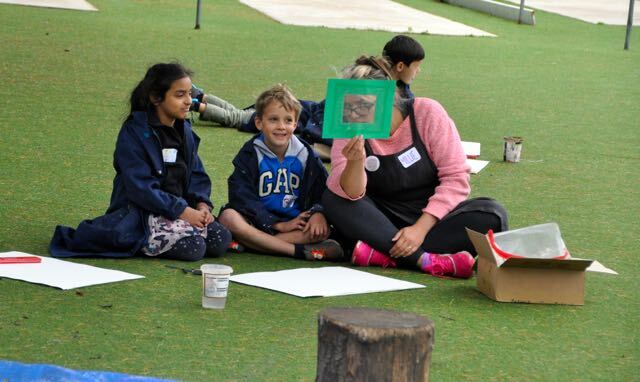 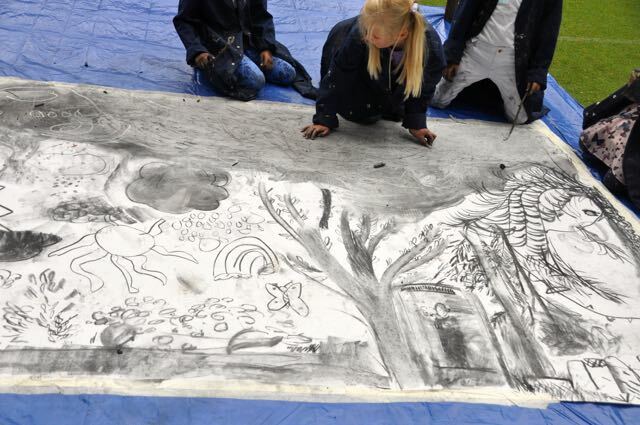 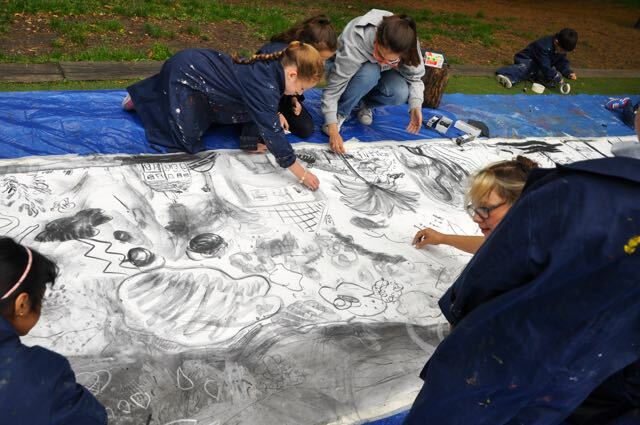 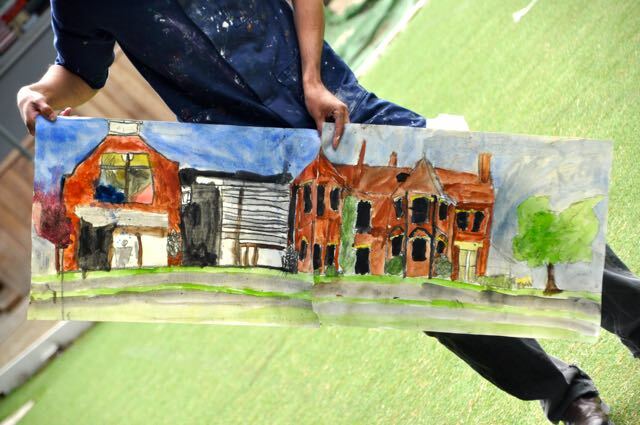 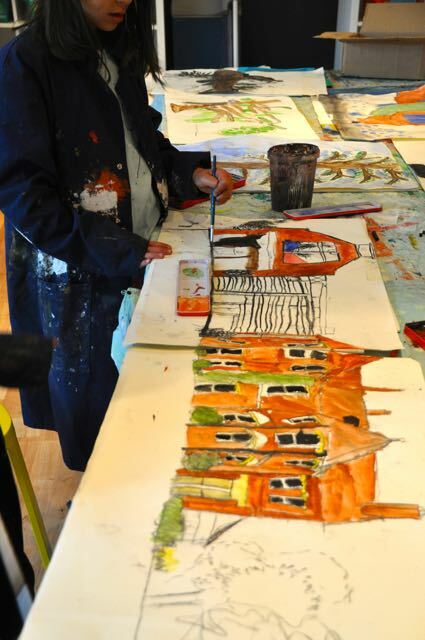 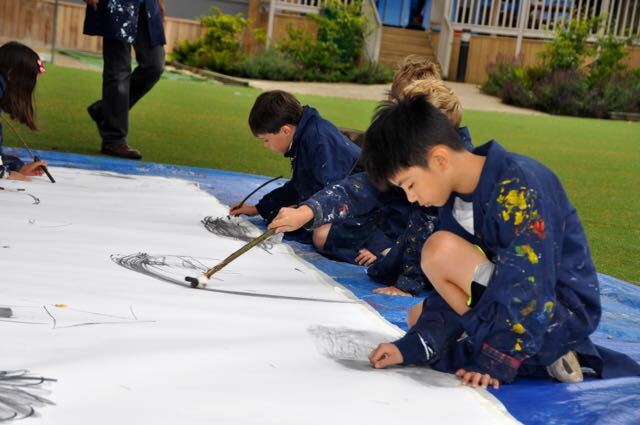 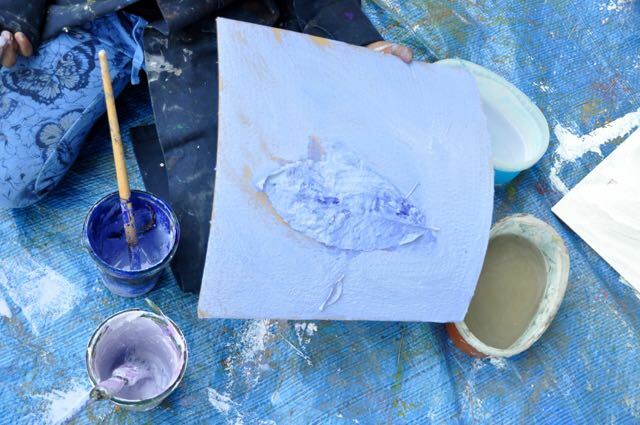 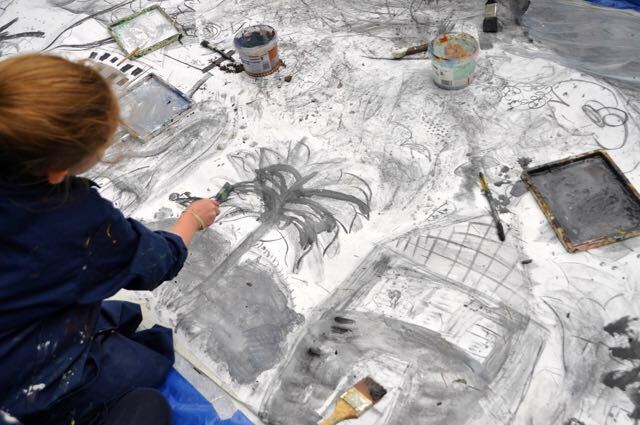 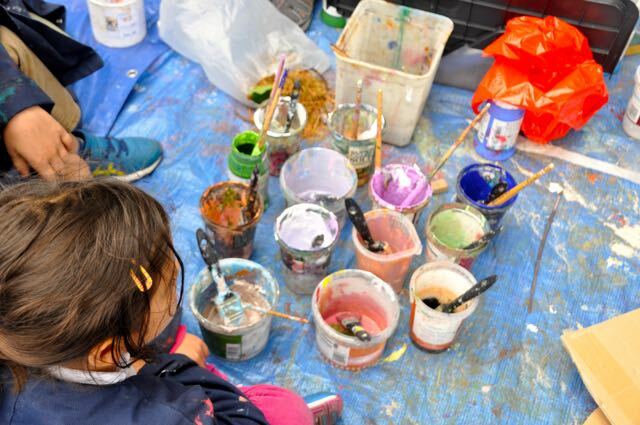 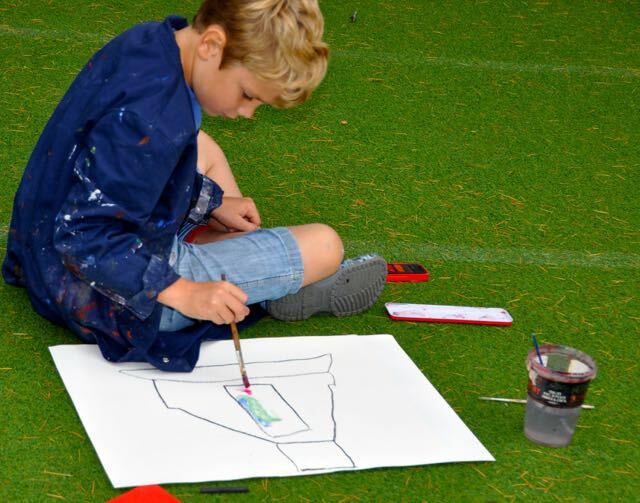 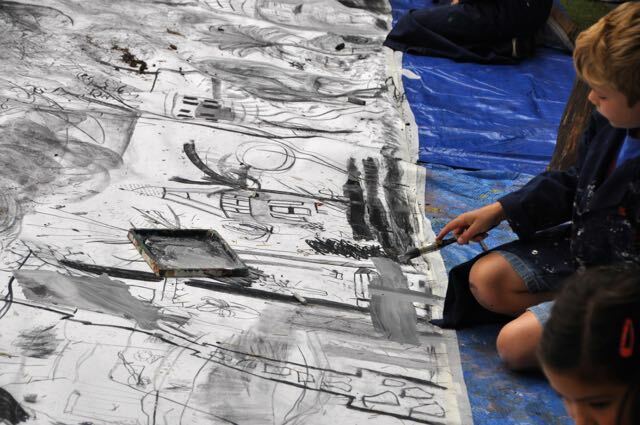 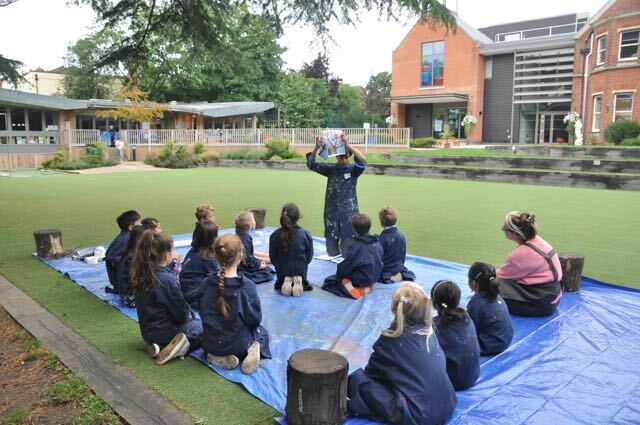 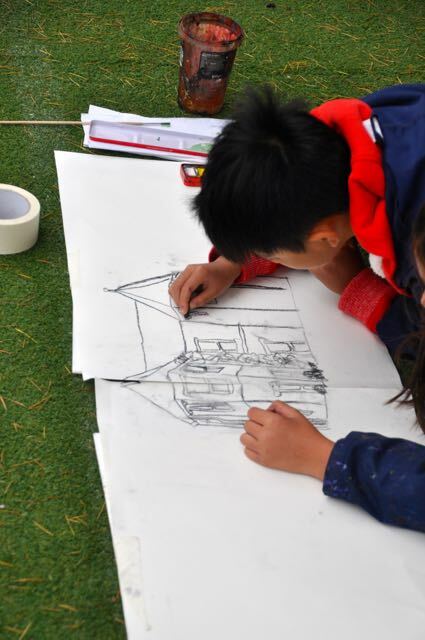 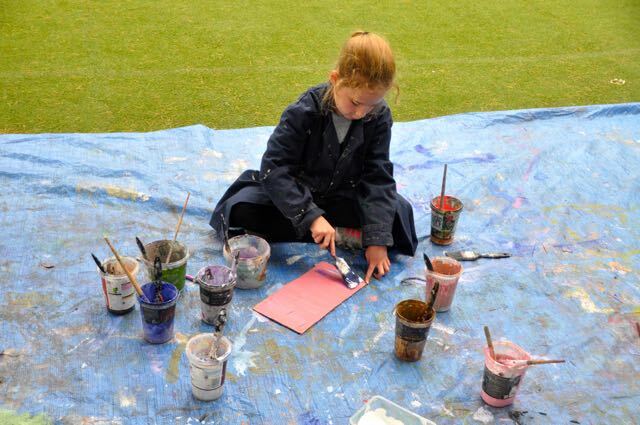 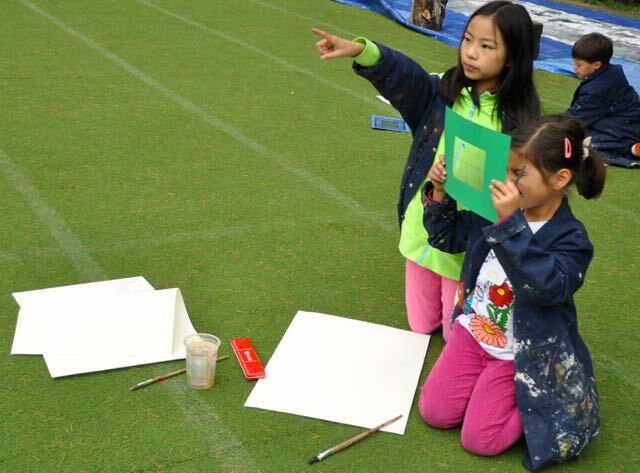 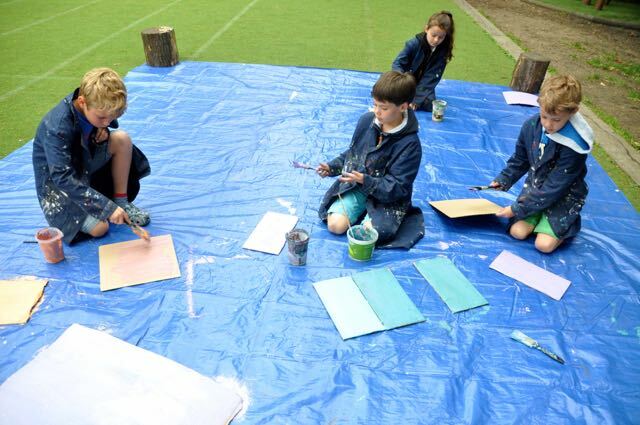 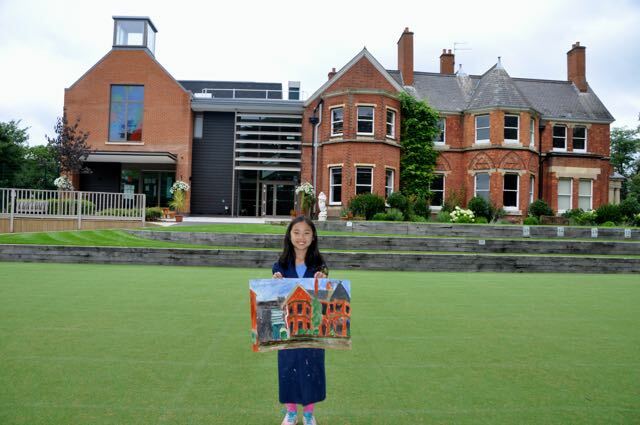 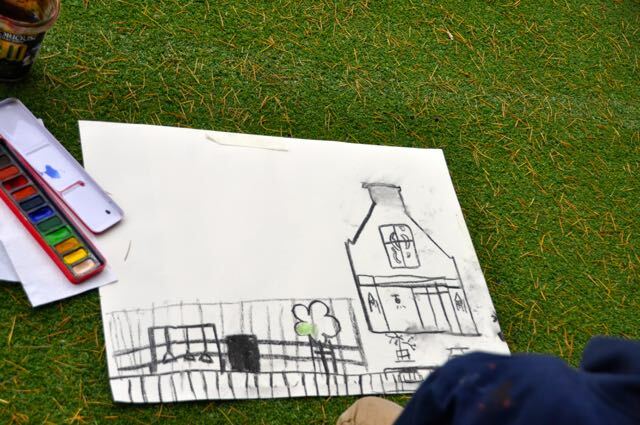 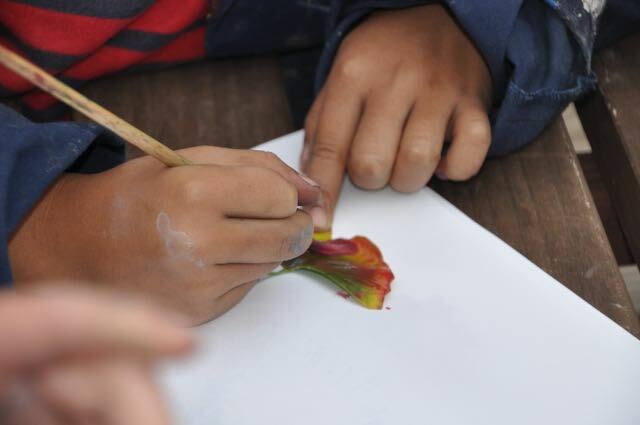 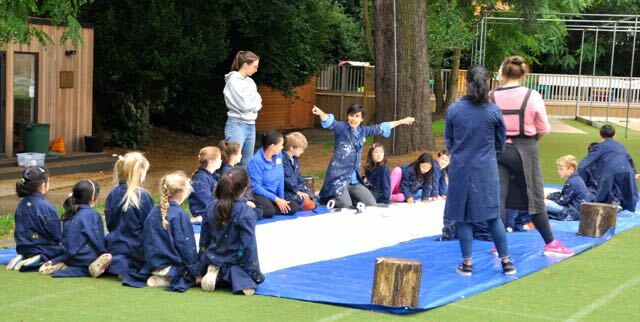 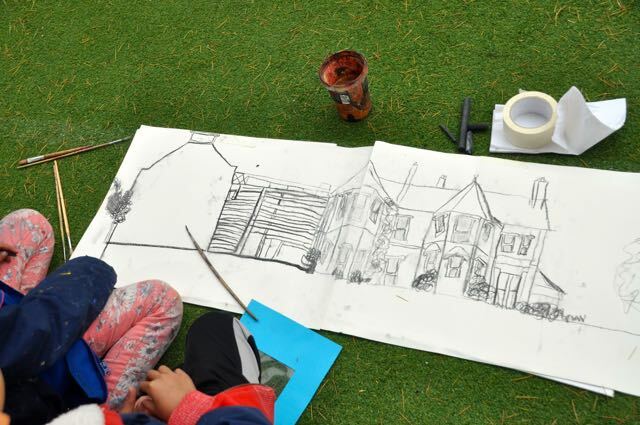 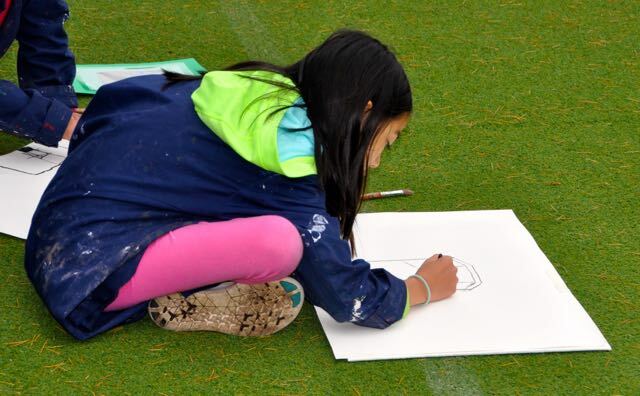 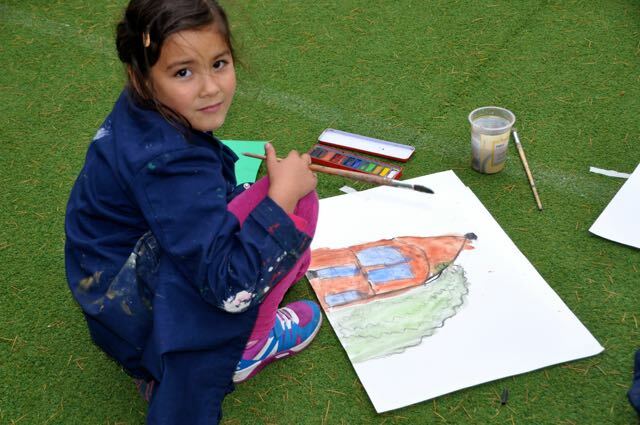 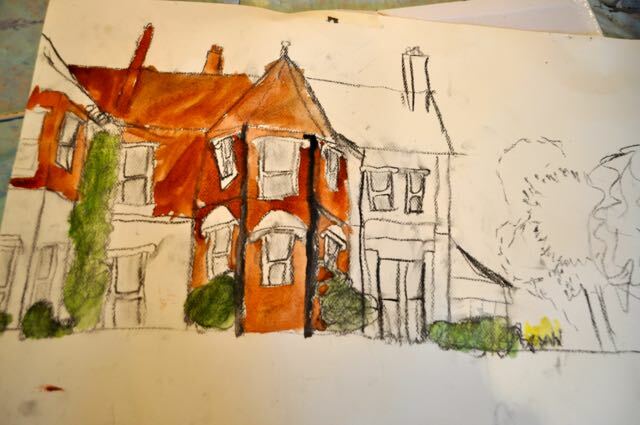 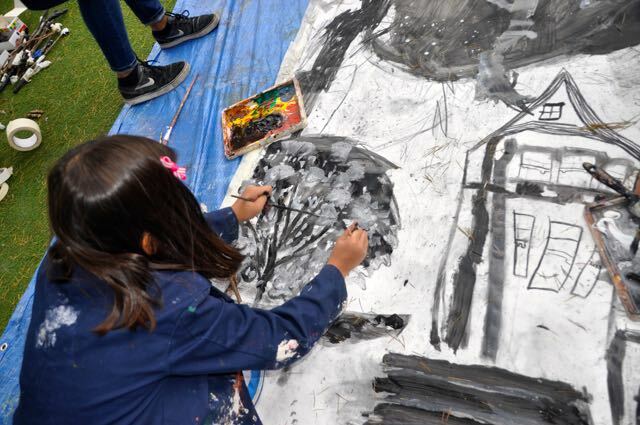 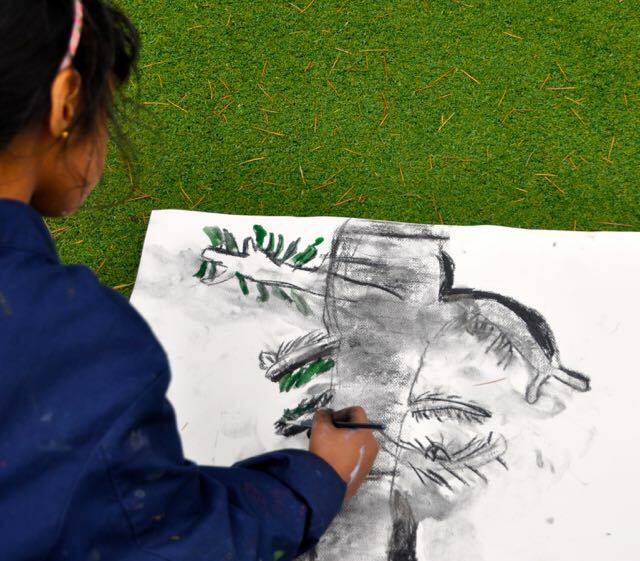 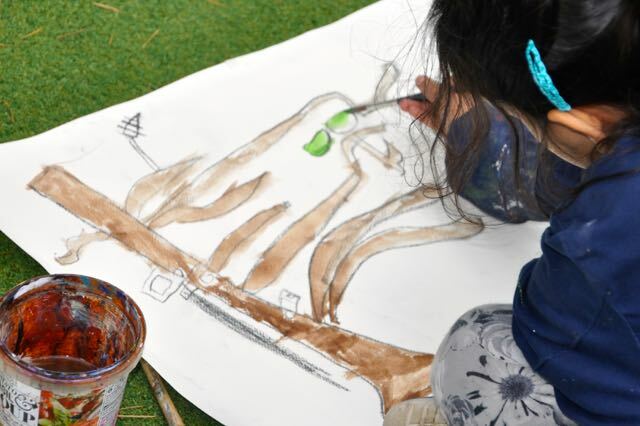 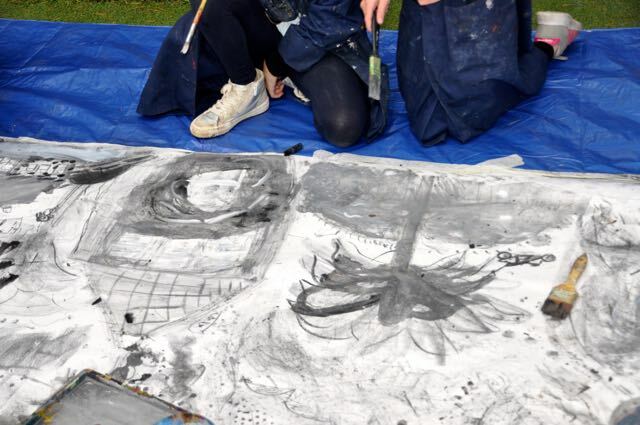 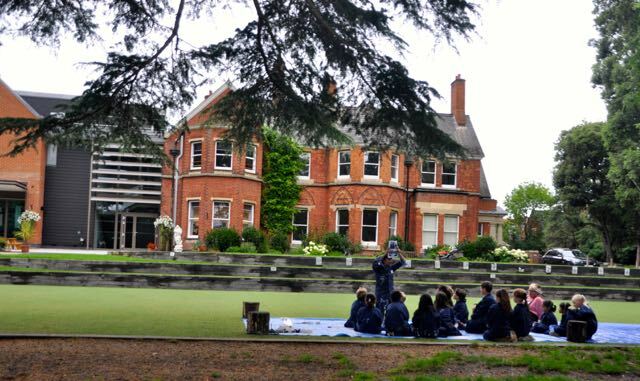 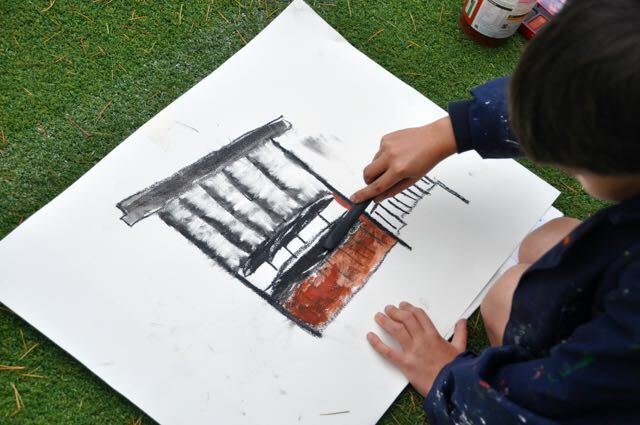 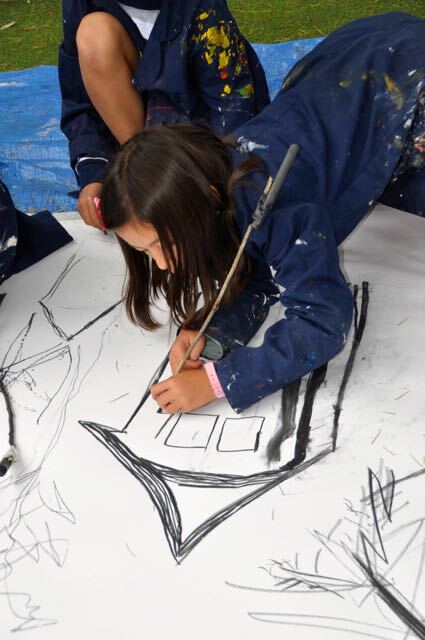 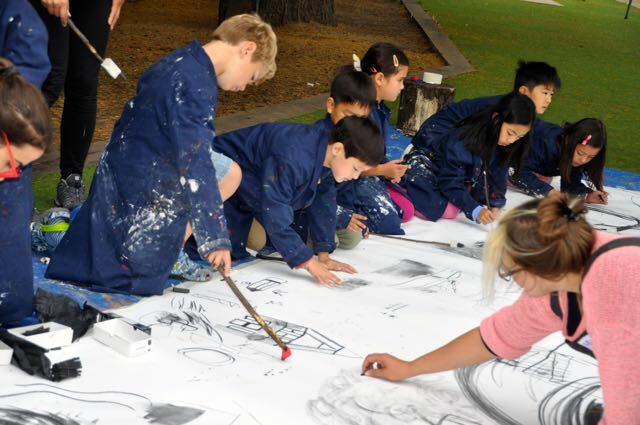 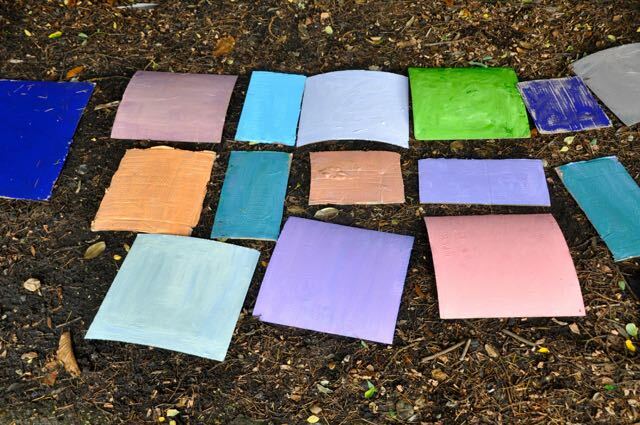 This year we are running 2 courses one at Donhead Prep school and the other in South Park Gardens, Wimbledon – two beautiful and contrasting settings where children can paint outside and take advantage of some beautiful stimuli – buildings, gardens, plants and trees. 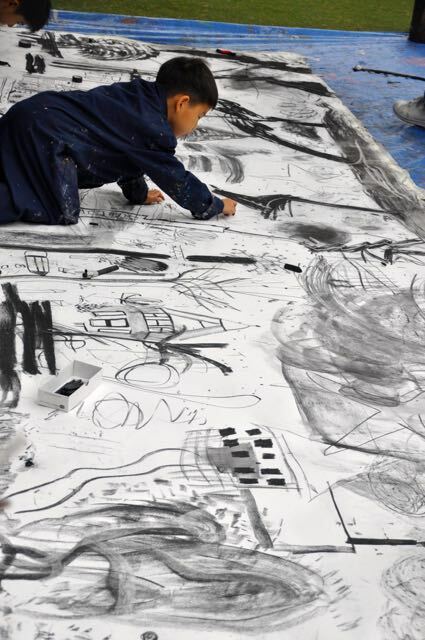 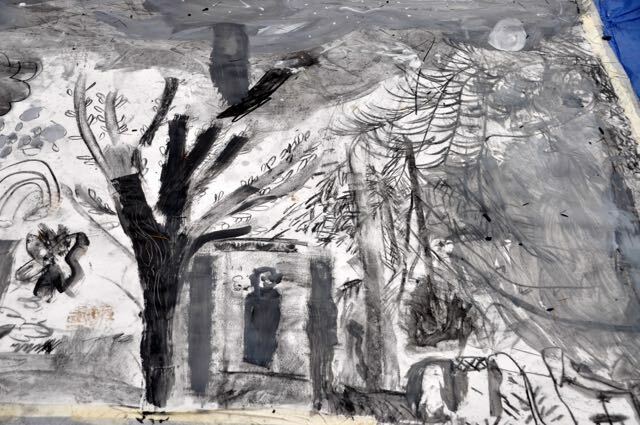 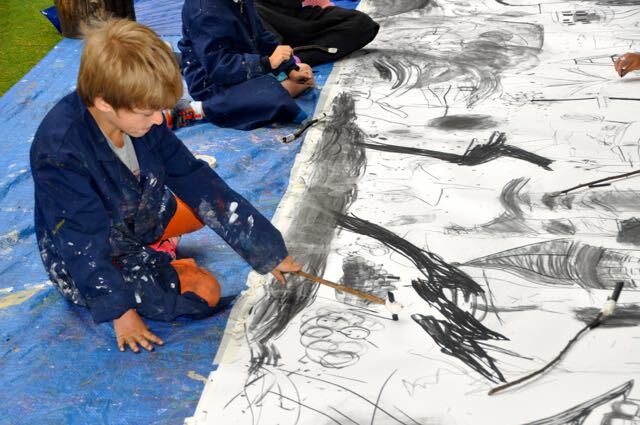 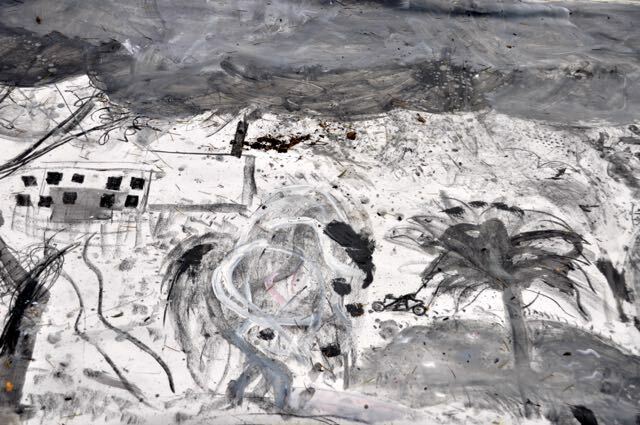 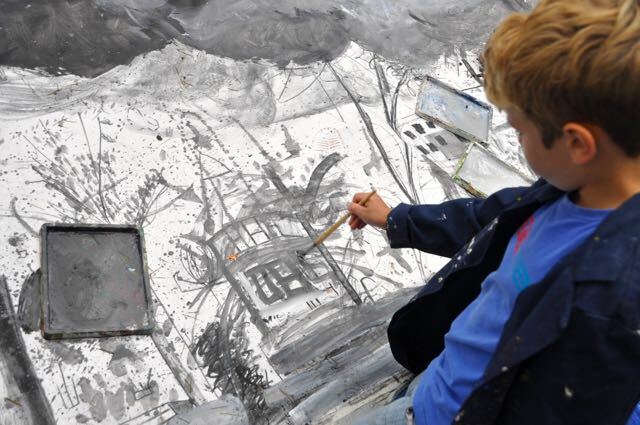 Matthew began by showing the children some of his own paintings, along with the work of John Virtue. 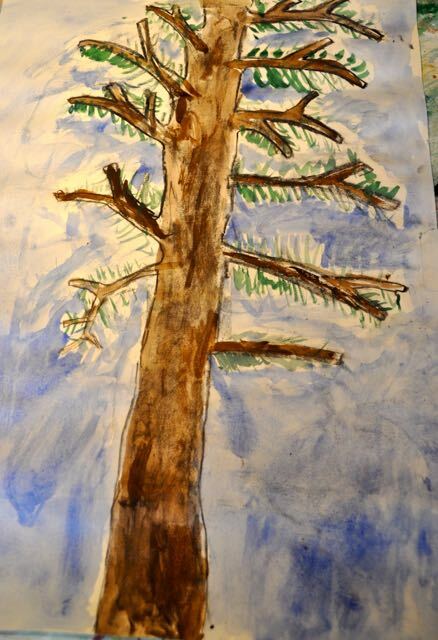 We talked about how artists have always been inspired by the great outdoors. 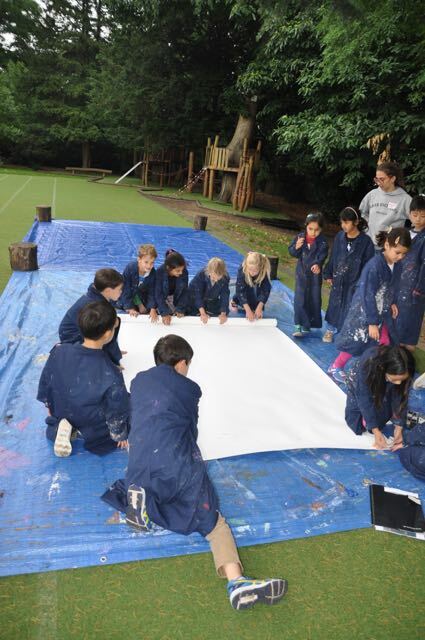 We then got to work and together unrolled a giant roll of beautiful heavyweight paper. 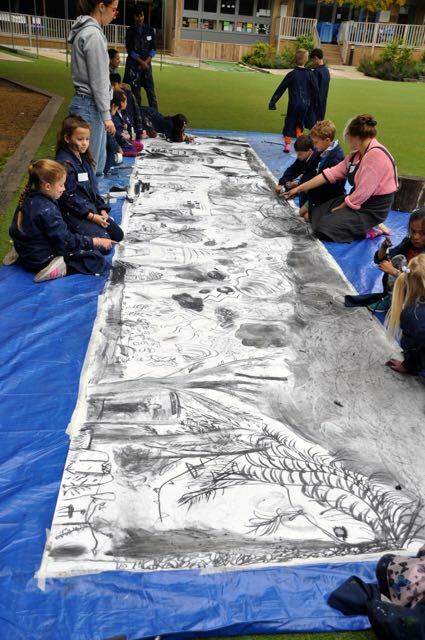 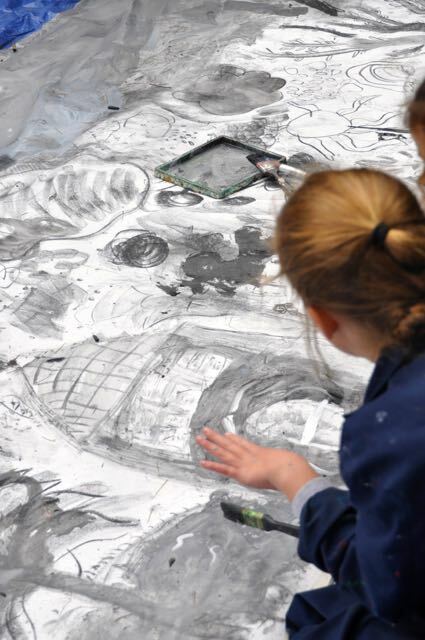 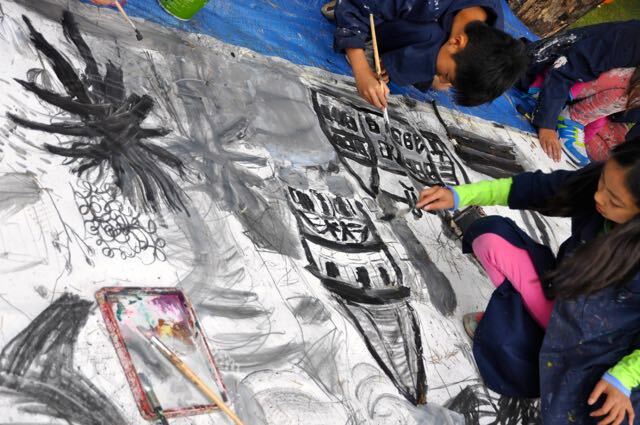 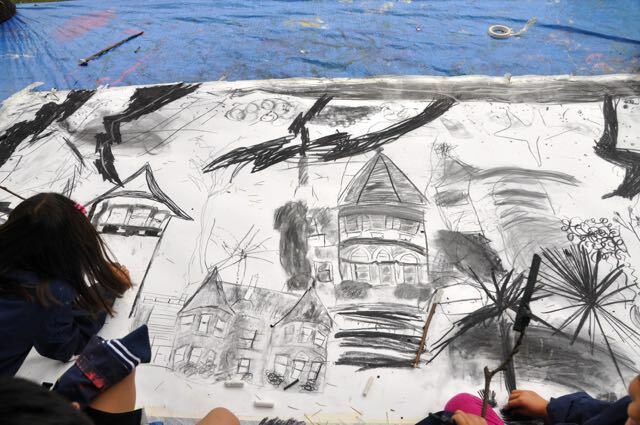 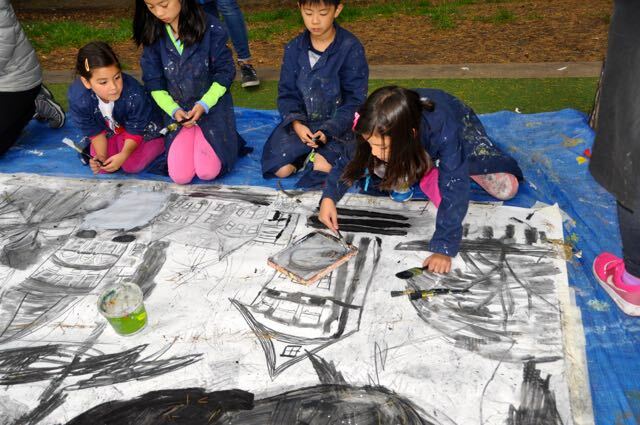 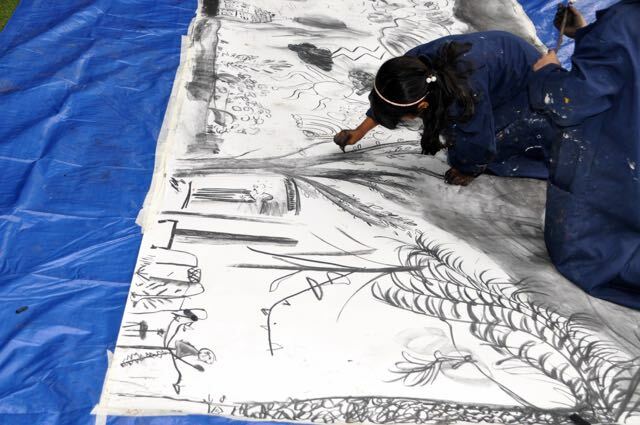 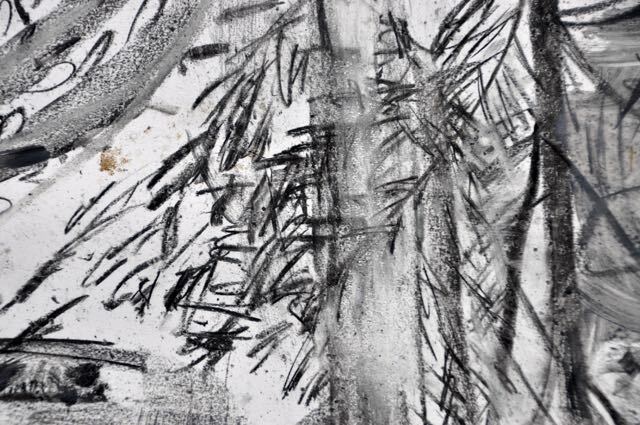 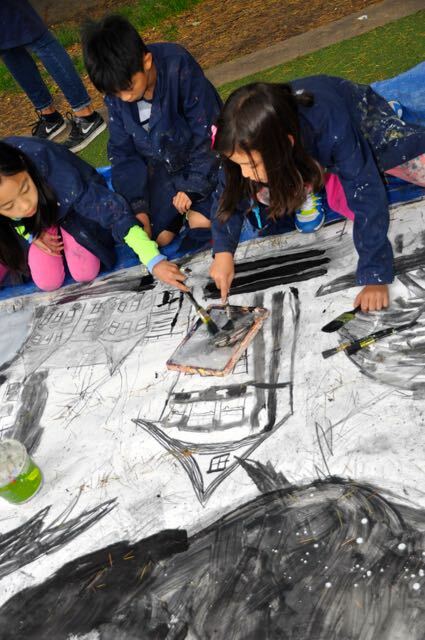 We would work together, look at our surroundings and work with charcoal to sketch what we saw. 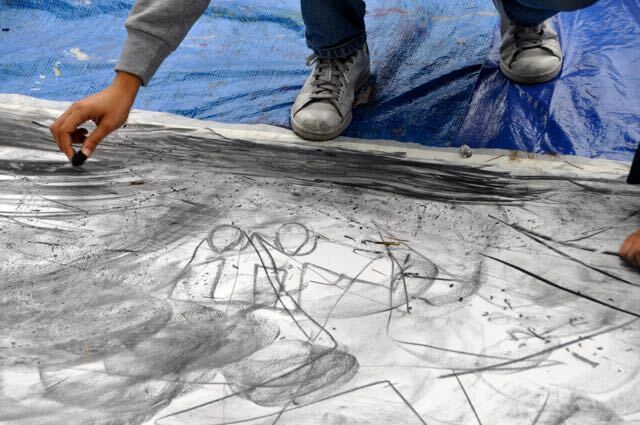 We had thick and thin charcoal sticks and Matthew suggested that we tape the charcoal to sticks and make our own drawing implements. 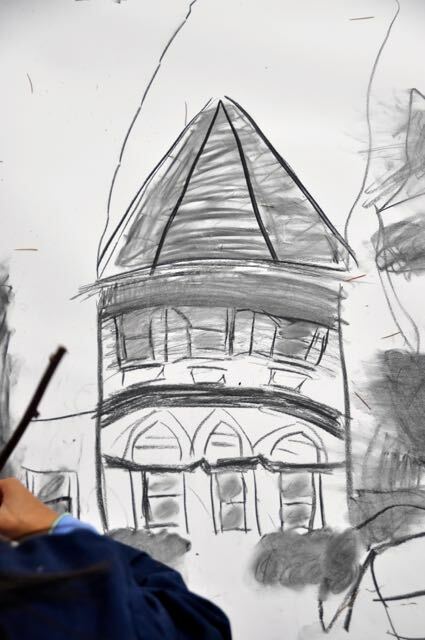 A longer tool is sometimes easier to draw with, especially on a larger scale. 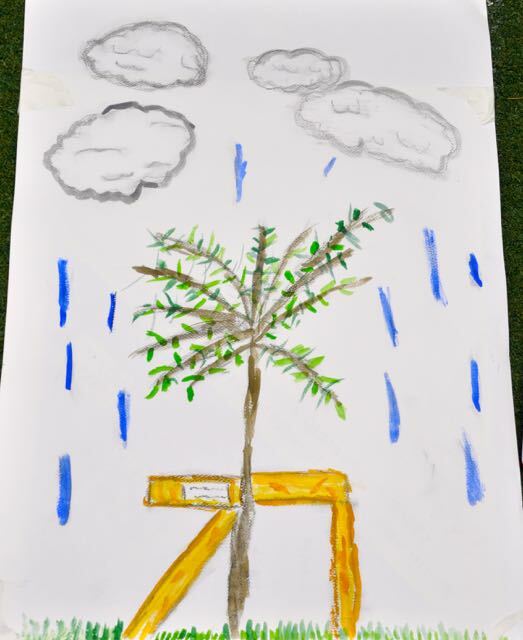 Some of us worked on the shrubs, bushes and buildings, while others got to grips with the dark brooding skies that were threatening our outdoor painting activity! 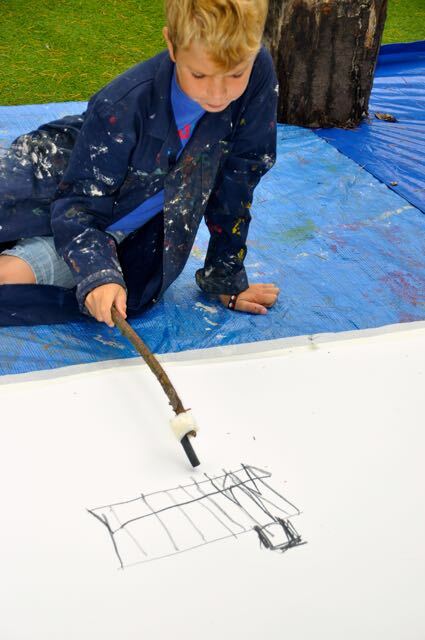 This implement has thick charcoal none end and thin on the other – to vary the quality of line easily…very resourceful! 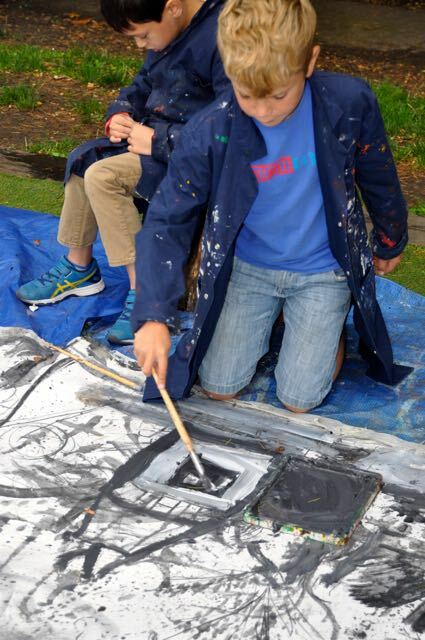 Matthew helped us out, demonstrating some techniques when they were needed. 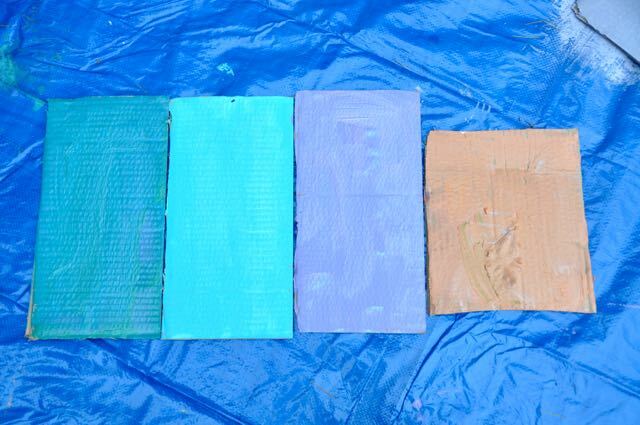 We were experimenting with some lovely results. 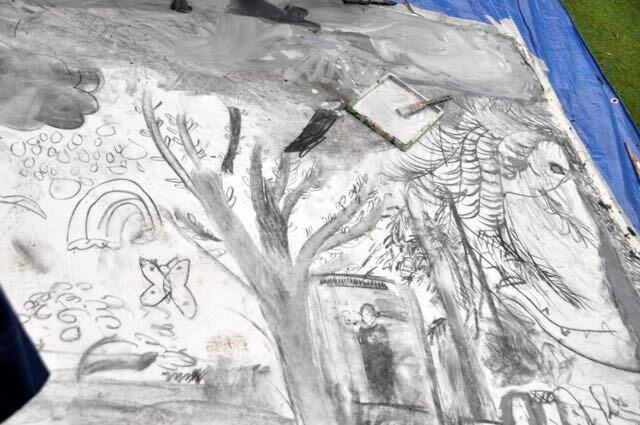 A wonderful scene was emerging based on the reality that we could see. 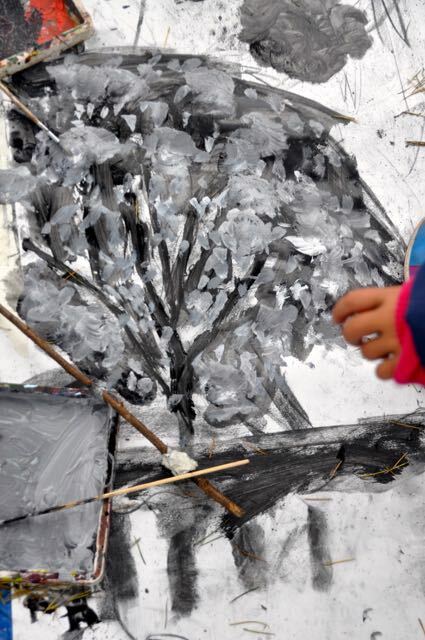 The chilly, cloudy atmosphere was inspiring the drawings and the overall mood of the piece! 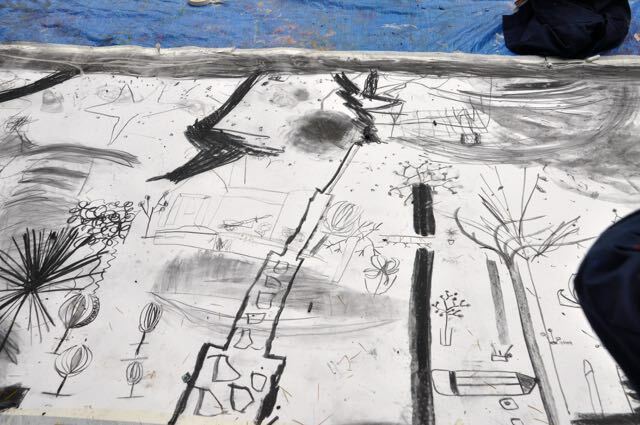 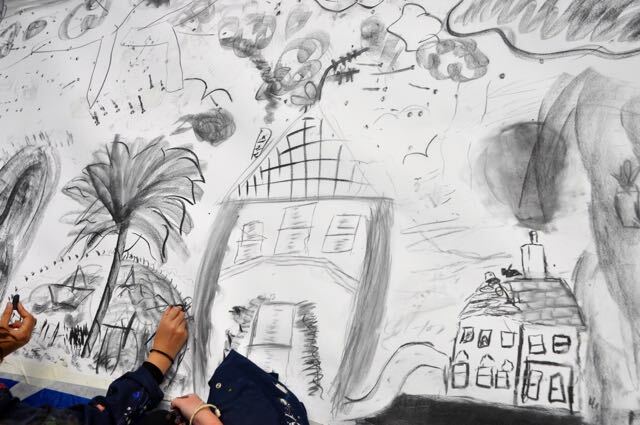 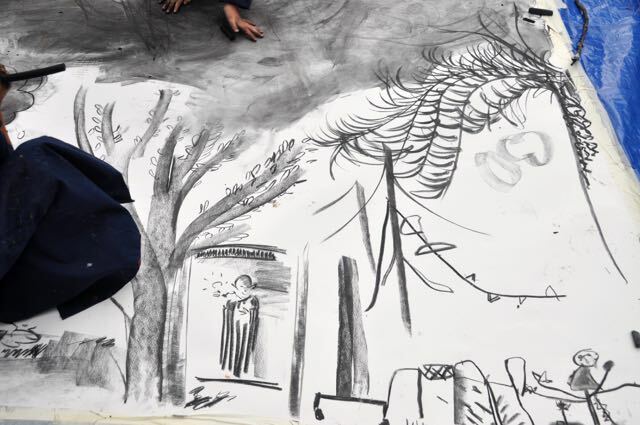 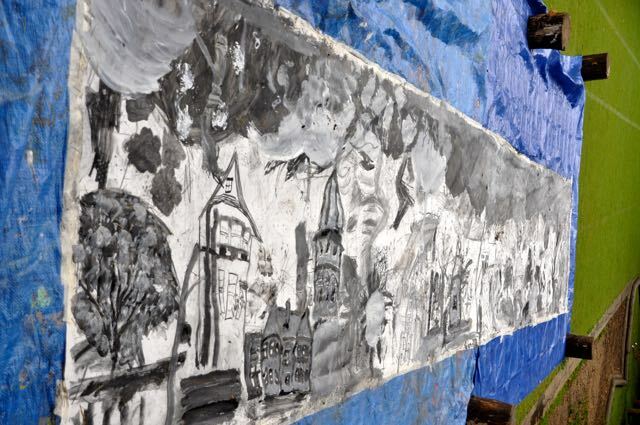 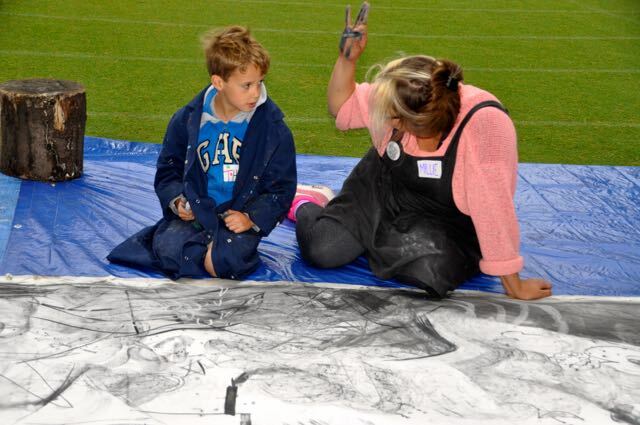 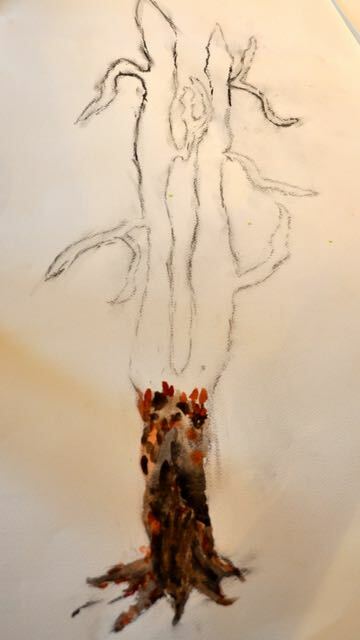 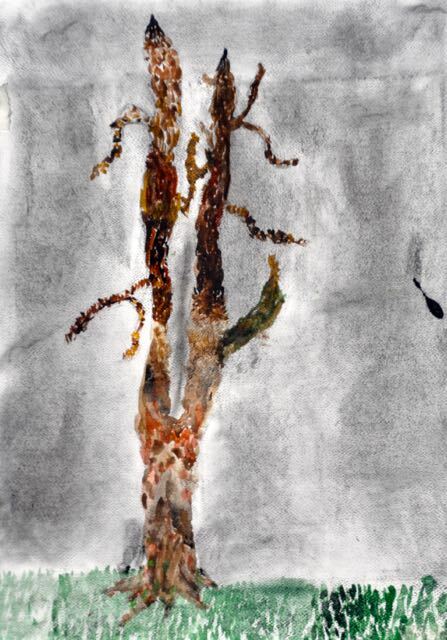 Thunderstorms appeared in the drawing – but not in real life….thank goodness! 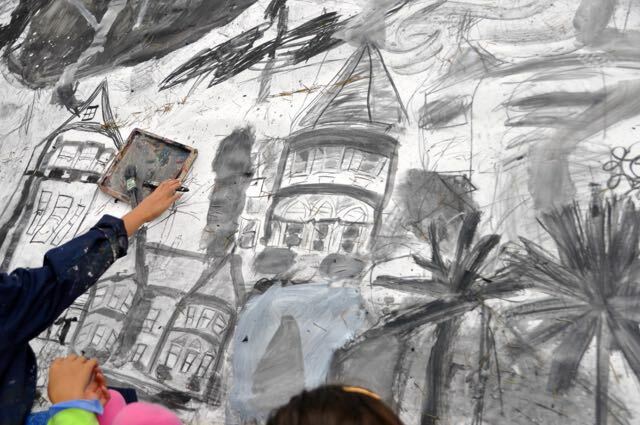 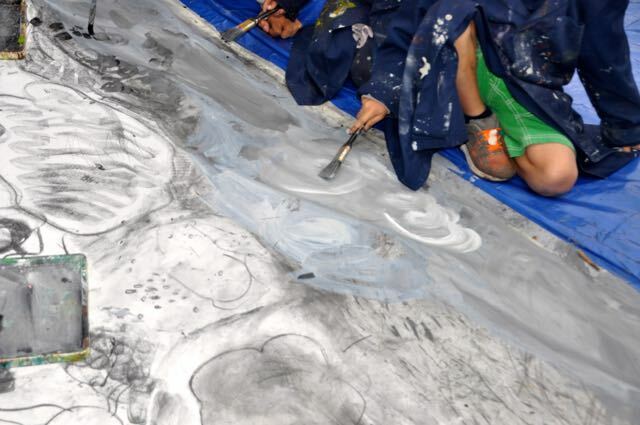 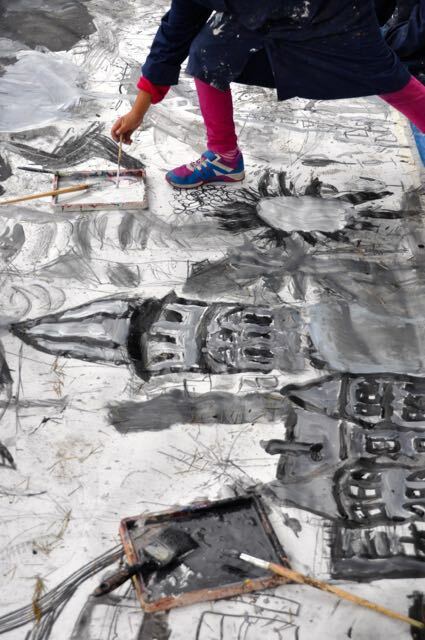 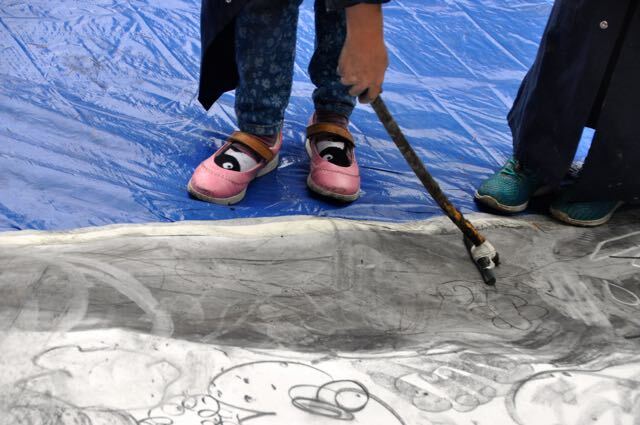 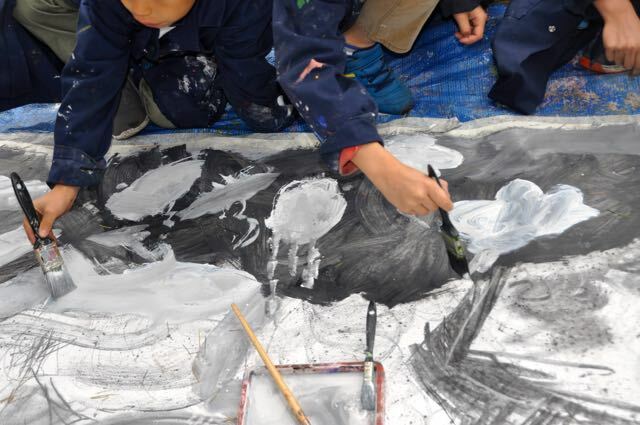 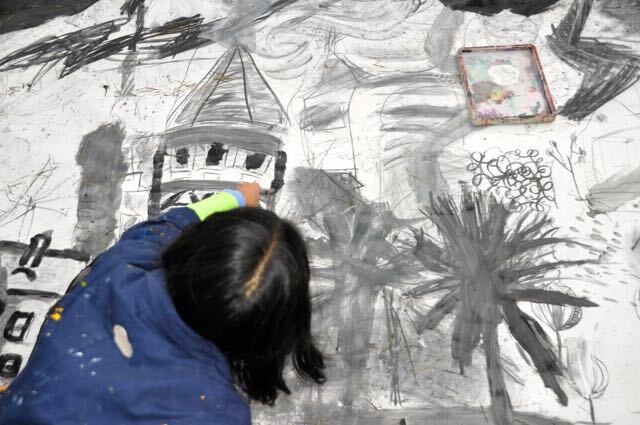 We introduced white chalk to layer on top of the charcoal and vary the effects. 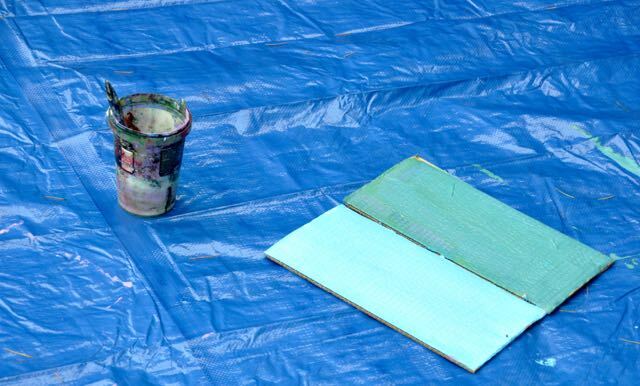 Then the paint came out. 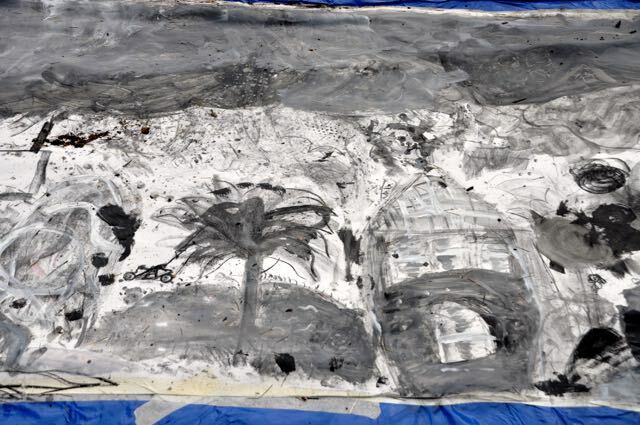 We limited the palette to just black and white so we had a unified piece of work. 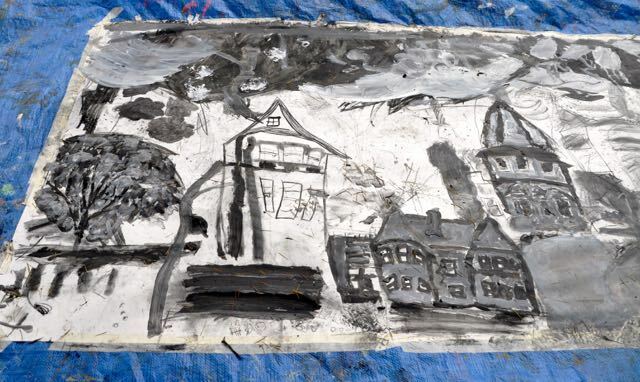 The buildings grew bolder and the skies more tempestuous! 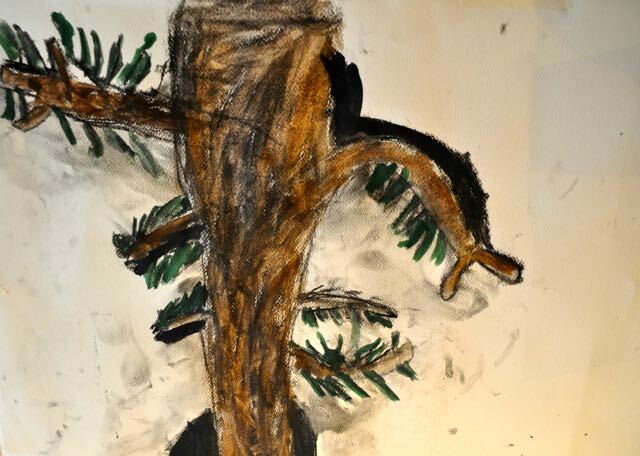 I think you will agree they worked together really well to produce a fantastic painting - very experimental with lots of different effects and styles. 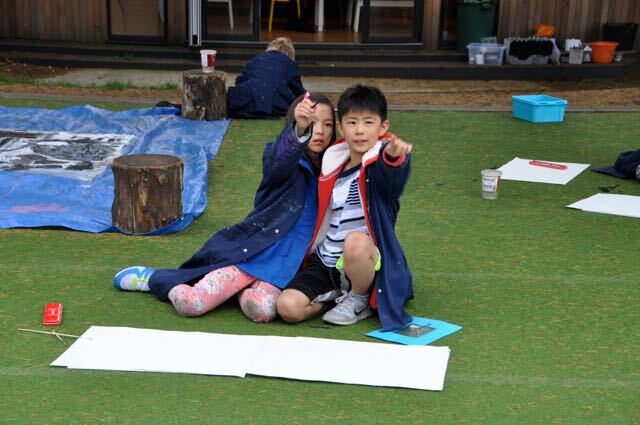 They had also had the opportunity to really observer their surroundings carefully ready for the next activity. 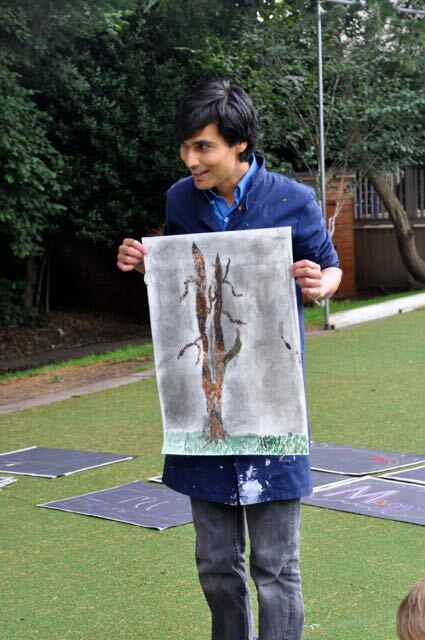 Matthew then showed the children some new techniques with watercolour paints and charcoal. 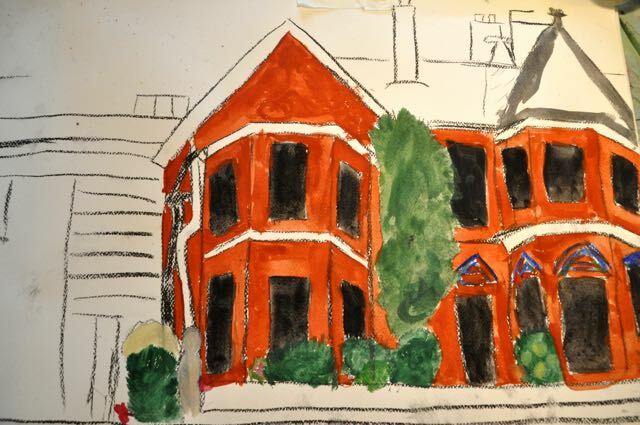 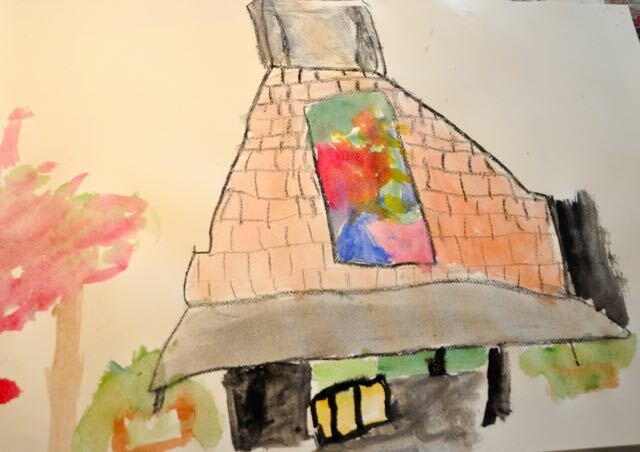 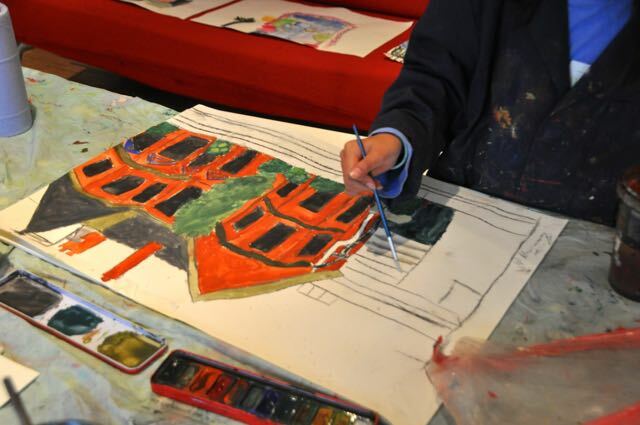 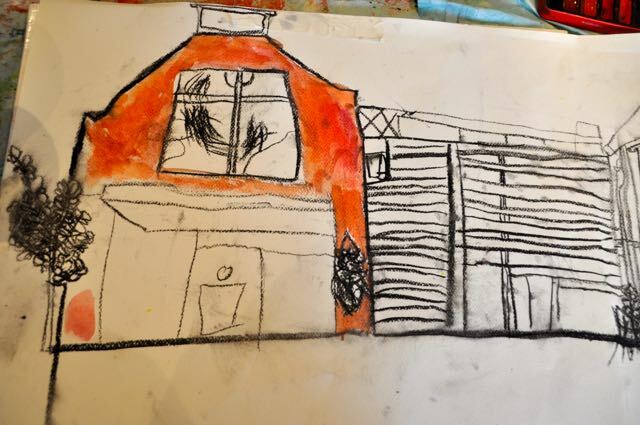 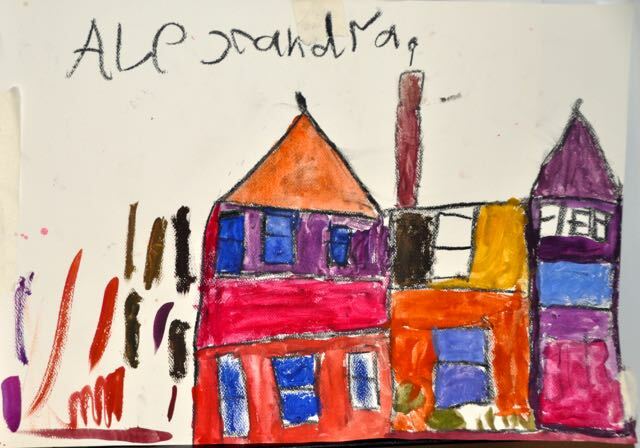 We chose an area of the gardens or building to focus on in more detail and worked on an individual piece with watercolour paints on water colour paper. 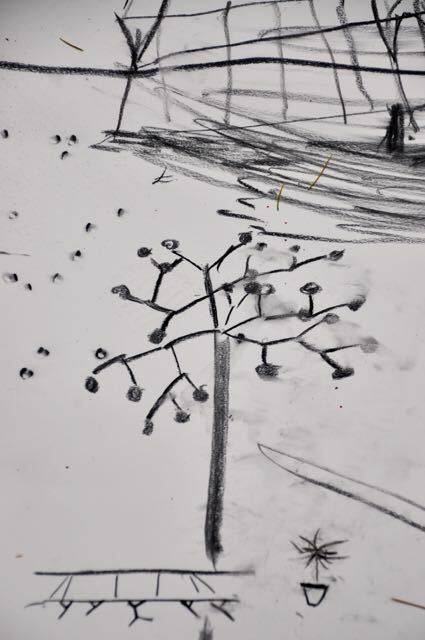 We used view finders to select an area and look closely. 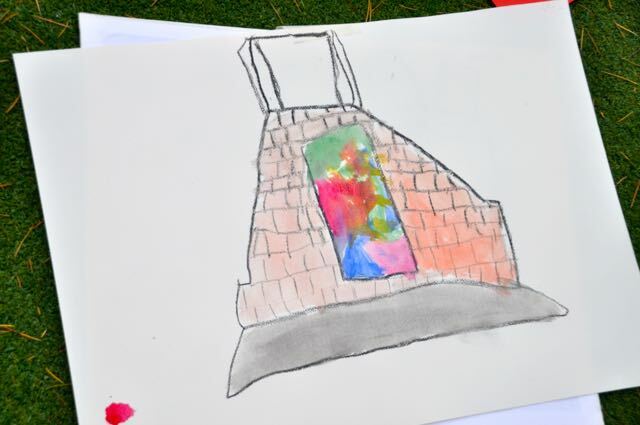 The building was a real inspiration. 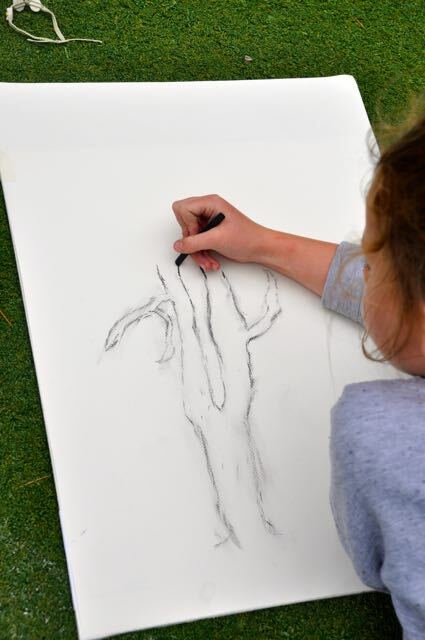 Some chose to make careful studies of the beautiful old trees in the gardens. 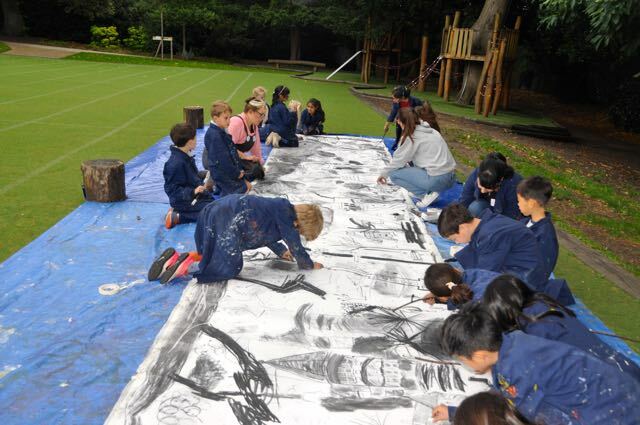 The children were incredibly focussed and some continued for the rest of the morning on one painting. 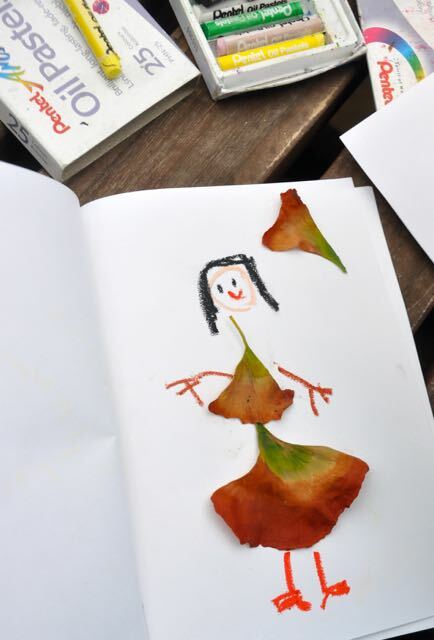 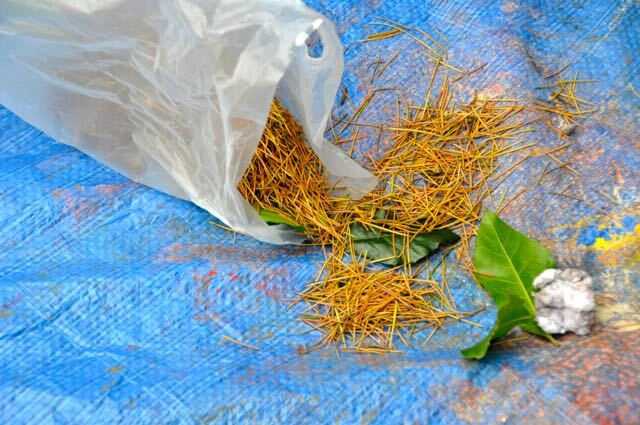 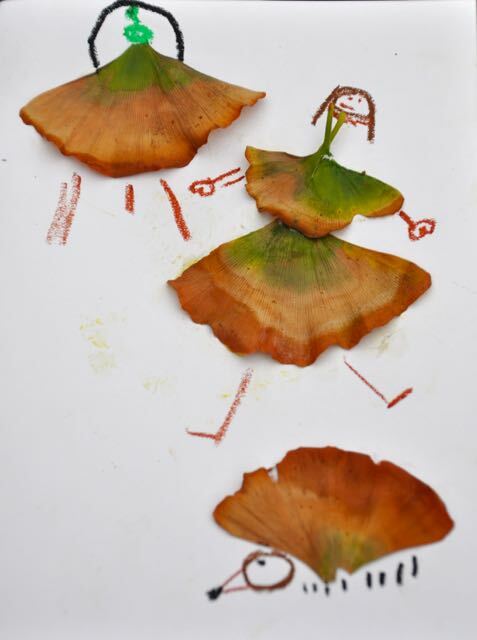 We had some other activities lined up for those working more quickly, using Ginko leaves to inspire new imaginative work. 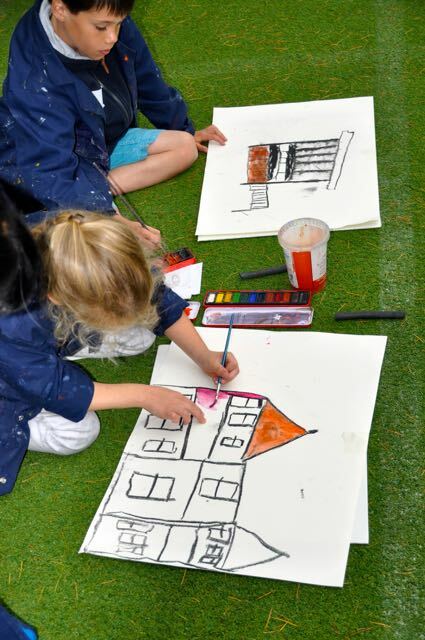 By lunch time we had a range of beautifully observed paintings. 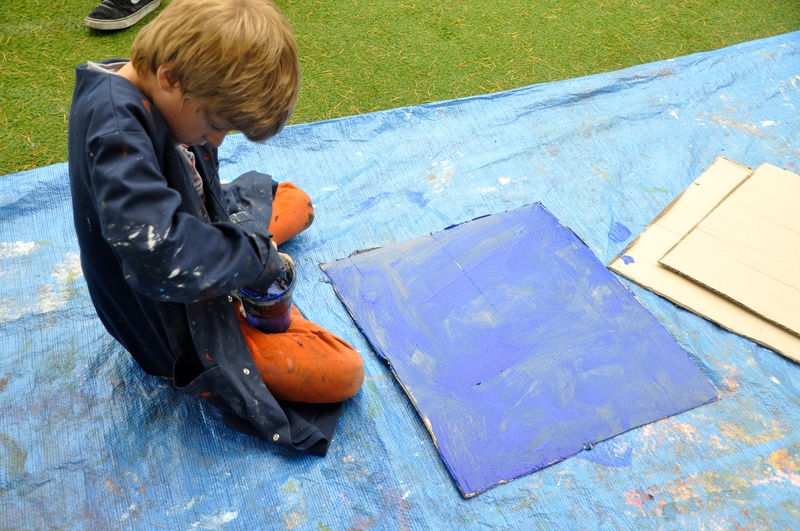 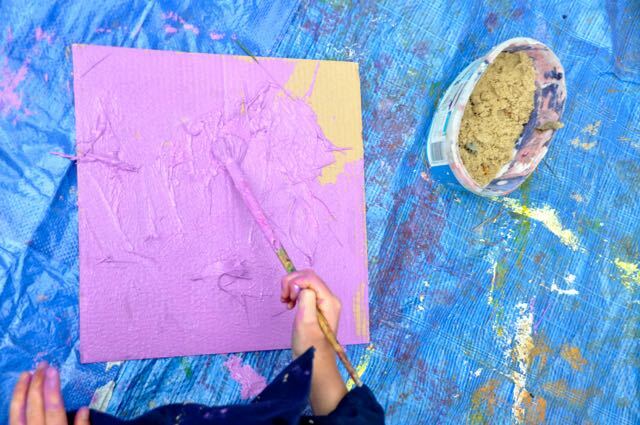 After lunch Matthew taught the children about priming surfaces to add layers to a painting. 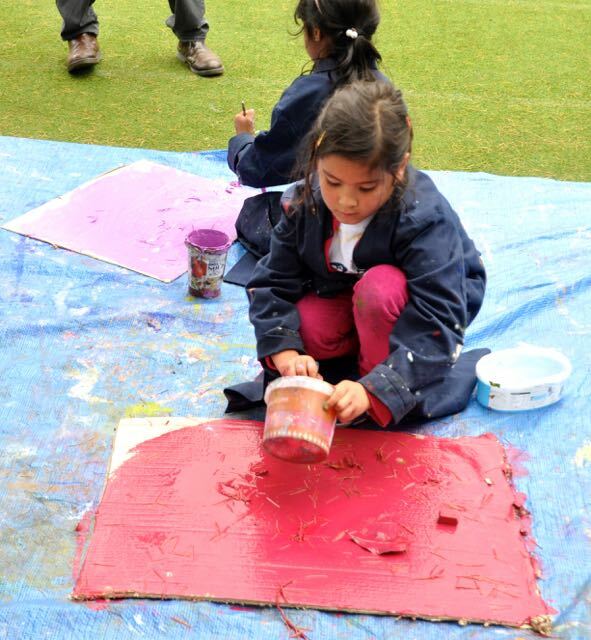 We used primer mixed with leaves, sand and pine needles to create a textured surface that we will paint upon tomorrow. 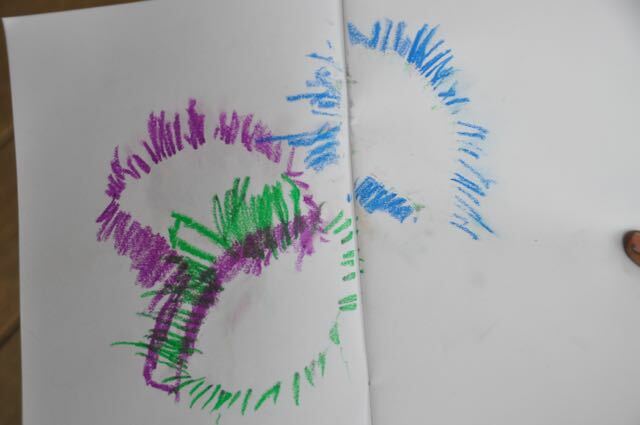 We added colour to make it more interesting. 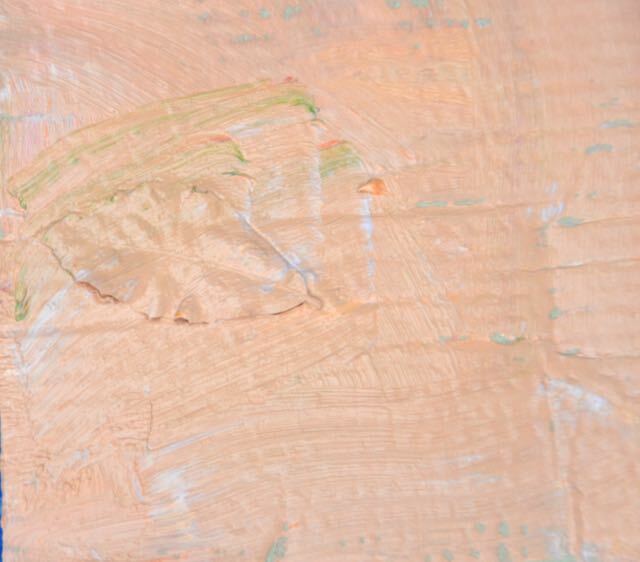 You can see the natural textures emerging from the painted layers. 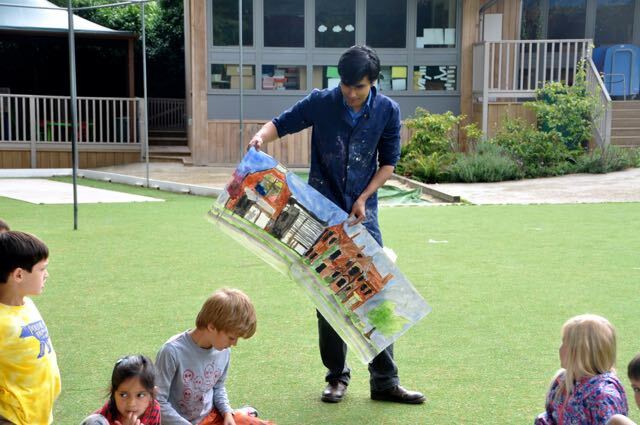 At the end of the day we all shared in each others work and discussed all we had learnt.